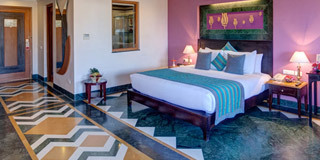 Ramada is the best luxury holiday resort in Udaipur which provides all the comfortable facilities along with luxury accommodation, rooms and suites with panoramic view. Spoil yourself with luxurious accommodation facilities at the Ramada, one of the best spa resorts in Udaipur. Ramada Udaipur offers beautiful rooms that boast of exquisite amenities and services. The rooms overlook the Aravalli Hills, Lake Pichola, Lake Fateh Sagar, Sajjan-Garh Fort popularly known as Monsoon Palace and the entire City. At this resort, the Deluxe and Super Deluxe Rooms are located in one wing and are open to natural ventilation. 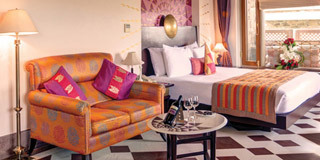 The Premium Rooms and Suites are located on the opposite side in nine clusters resembling independent villas. More than 400 sq ft. in area, the rooms and suites of this spa resort are elegantly designed with fine Indian textiles and are replete with an additional private sit out. The thickness of the wall and the high ceiling ensures that the room remains naturally cool. 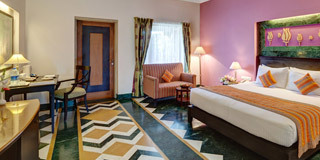 Corridors are adorned with the famous Udaipur Green Marble, Agariya White Marble and Jaisalmer Yellow Marble creating a colourful mosaic reflecting the traditional architecture of the Mewar region. 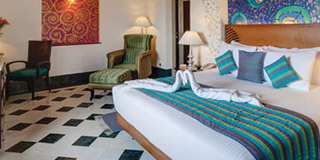 © Ramada Udaipur Resort & Spa. All rights reserved.